Answer: C and D. Console port and MGMT interface are available on all MDS product family switches. COM1 port is available on all MDS product family switches except the MDS 9700 switch. Q2. During the initial setup script of MDS 9500, which interfaces can be configured with the IPv6 address? Answer: E. The initial setup script of MDS 9500 does not allow you to configure IPv6 addresses. Q3. During the initial setup script of MDS 9706, how can you configure in-band management? a. Via answering yes to Configure Advanced IP Options. b. Via enabling SSH service. c. There is no configuration option for in-band management on MDS family switches. d. MDS 9706 family director switch does not support in-band management. Therefore, the user should answer yes to the first question to enter into the Advanced IP Options in the setup script. Q4. Which MDS switch models support Power On Auto Provisioning with NX-OS 6.2(9)? Answer: B and C. Starting with NX-OS 6.2(9), the POAP capability is available on Cisco MDS 9148 and MDS 9148S Multilayer Fabric Switches (at the time of writing this book). Q5. How does the On-Demand Port Activation license work on the Cisco MDS 9148S 16G FC switch? a. The base configuration of 20 ports of 16Gbps Fibre Channel, two ports of 10 Gigabit Ethernet for FCIP and iSCSI storage services, and eight ports of 10 Gigabit Ethernet for FCoE connectivity. b. The base switch model comes with 12 ports enabled and can be upgraded as needed with the 12-port activation license to support 24, 36, or 48 ports. c. The base switch model comes with eight ports and can be upgraded to models of 16, 32, or 48 ports. d. The base switch model comes with 24 ports enabled and can be upgraded as needed with a 12-port activation license to support 36 or 48 ports. Answer: B. The Cisco MDS 9250i is available in a base configuration of 20 ports (upgradable to 40 through On-Demand Port Activation license) of 16Gbps Fibre Channel, two ports of 10 Gigabit Ethernet for FCIP and iSCSI storage services, and eight ports of 10 Gigabit Ethernet for FCoE connectivity. On the Cisco MDS 9148, the On-Demand Port Activation license allows the addition of eight 8Gbps ports. Customers have the option of purchasing preconfigured models of 16, 32, or 48 ports and upgrading the 16- and 32-port models onsite, all the way to 48 ports by adding these licenses. The Cisco MDS 9148S is a one rack-unit (1RU) switch that scales from 12 to 48 linerate 16Gbps Fibre Channel ports. The base switch model comes with 12 ports enabled and can be upgraded as needed with the 12-port Cisco MDS 9148S On-Demand Port Activation license to support configurations of 24, 36, or 48 enabled ports. Q6. Which is the correct option for the boot sequence? Answer: B. Figure 23-4 explains the correct boot sequence. It is BIOS—Loader—Kickstart—System. Q7. Which of the following options is the correct configuration for in-band management of MDS 9250i? Answer: A, B, and D. The correct member for the specified zone is based on the type (pWWN, fabric pWWN, FC ID, FC alias, domain ID, IPv4 address, IPv6 address, or interface) and value specified. Q9. In which of the following trunk mode configurations between two MDS switches we can achieve trunking states are ISL and port modes are E port? a. Switch 1: Switchport mode E, trunk mode off; Switch 2: Switchport mode E, trunk mode off. b. Switch 1: Switchport mode E, trunk mode on; Switch 2: Switchport mode E, trunk mode on. c. Switch 1: Switchport mode E, trunk mode off; Switch 2: Switchport mode F, trunk mode auto. d. Switch 1: Switchport mode E, trunk mode auto; Switch 2: Switchport mode E, trunk mode auto. e. No correct answer exists. Q10. 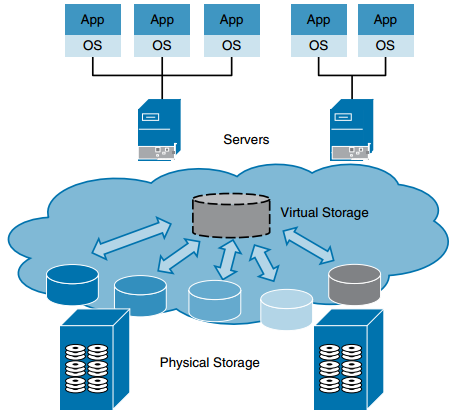 Which of the following organizations defines the storage virtualization standards? a. INCITS (International Committee for Information Technology Standards). b. IETF (Internet Engineering Task Force). c. SNIA (Storage Networking Industry Association). d. Storage virtualization has no standard measure defined by a reputable organization. Answer: D. Unlike previous new protocols or architectures, storage virtualization has no standard measure defined by a reputable organization such as the INCITS (International Committee for Information Technology Standards) or the IETF (Internet Engineering Task Force). The closest vendor-neutral attempt to make storage virtualization concepts comprehensible has been the work of the Storage Networking Industry Association (SNIA). Answer: A, B, C, and D. What is being virtualized may include disks, blocks, tape systems, file systems, and files or records. Q12. Which of the following options explains RAID 1+0? a. It is an exact copy (or mirror) of a set of data on two disks. b. It comprises block-level striping with distributed parity. c. It comprises block-level striping with double distributed parity. d. It creates a striped set from a series of mirrored drives. Answer: D. RAID 1+0 creates a striped set from a series of mirrored drives. The array can sustain multiple drive losses as long as no mirror loses all its drives. Q13. Which of the following options explains RAID 6? c. It creates a striped set from a series of mirrored drives. d. It comprises block-level striping with double distributed parity. Answer: D. RAID 6 comprises block-level striping with double distributed parity. a. It is a feature of Fibre Channel HBA. b. It is a feature of storage arrays. c. It provides basic LUN-level security by allowing LUNs to be seen by selected servers. d. It is a proprietary technique that Cisco MDS switches offer. e. It should be configured on HBAs. Answer: B and C. LUN masking, a feature of enterprise storage arrays, provides basic LUNlevel security by allowing LUNs to be seen only by selected servers that are identified by their port World Wide Name (pWWN). Each storage array vendor has its own management and proprietary techniques for LUN masking in the array. In a heterogeneous environment with arrays from different vendors, LUN management becomes more difficult. a. The LVM manipulates LUN representation to create virtualized storage to the file system. b. The LVM is a collection of ports from a set of connected Fibre Channel switches. c. LVM combines multiple hard disk drive components into a logical unit to provide data redundancy. d. LVMs can be used to divide large physical disk arrays into more manageable virtual disks. Answer: A and D. The Logical Volume Manager performs virtualization tasks at the host operating systems. The LVM manipulates LUN representation to create virtualized storage to the file system or database manager. LVMs can be used to divide large physical disk arrays into more manageable virtual disks or to create large virtual disks from multiple physical disks. The logical volume manager treats any LUN as a vanilla resource for storage pooling; it will not differentiate the RAID levels. Therefore, the storage administrator must ensure that the appropriate classes of storage under LVM control are paired with individual application requirements. Q16. Select the correct order of operations for completing asynchronous array-based replication. I. The write operation is received by the primary storage array from the host. II. An acknowledgement is sent to the primary storage array by a secondary storage array after the data is stored on the secondary storage array. III. The write operation to the primary array is acknowledged locally; the primary storage array does not require a confirmation from the secondary storage array to acknowledge the write operation to the server. IV. The primary storage array maintains new data queued to be copied to the secondary storage array at a later time. It initiates a write to the secondary storage array. a. I, II, III, IV. b. I, III, IV, II. c. III, I, II, VI. d. I, III, II, IV. e. Asynchronous mirroring operation was not explained correctly. The write operation is received by the primary storage array from the host. The primary storage array does not require a confirmation from the secondary storage array to acknowledge the write operation to the server. The primary storage array maintains new data queued to be copied to the secondary storage array at a later time. It initiates a write to the secondary storage array. An acknowledgement is sent to the primary storage array by the secondary storage array after the data is stored on the secondary storage array. a. It is close to the file system. b. It uses the operating system’s built-in tools. c. It is licensed and managed per host. d. It uses the array controller’s CPU cycles. e. It is independent of SAN transport. Answer: A, B, and E. The main advantages of host-based storage virtualization are that it is independent of the storage subsystem, it is close to the file system, it uses the operating system’s built-in tools, there are no array controller cycles, it is independent of SAN transport, and it is a software solution. Answer: A, B, and E.
Priority-based Flow Control (PFC): IEEE 802.1Qbb provides a link-level flowcontrol mechanism that can be controlled independently for each frame priority. The goal of this mechanism is to ensure zero loss under congestion in DCB networks. Enhanced Transmission Selection (ETS): IEEE 802.1Qaz provides a common management framework for assignment of bandwidth-to-frame priorities. Congestion Notification (QCN): IEEE 802.1Qau provides end-to-end congestion management for protocols that are capable of transmission rate limiting to avoid frame loss. It is expected to benefit protocols such as TCP that do have native congestion management as it reacts to congestion in a timely manner. Data Center Bridging Capabilities Exchange Protocol (DCBX): A discovery and capability exchange protocol that is used for conveying capabilities and configuration of the preceding features between neighbors to ensure consistent configuration across the network. This protocol leverages functionality provided by IEEE 802.1AB (LLDP). It is actually included in the 802.1az standard. Q19. Which option best defines the need for data center bridging (DCB)? a. A set of standards designed to replace the existing Ethernet and IP protocol stack with a goal of enhancing existing transmissions for delay-sensitive applications. b. A set of standards designed to transparently enhance Ethernet and IP traffic and provide special treatment and features for certain traffic types such as FCoE and HPC. c. An emerging LAN standard for future delay-sensitive device communication. d. A single protocol that is designed to transparently enhance Ethernet and IP traffic and provide special treatment and features for certain traffic types such as FCoE and HPC. Answer: B. A set of standards designed to transparently enhance Ethernet and IP traffic and provide special treatment and features for certain traffic types such as FCoE and HPC. Q20. Which of the following options are correct for FIP and FCoE Ethertypes? Answer: A. FCoE 0x8906, FIP 0x8914.